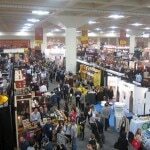 The Winter Fancy Food Show, which was recently held in San Francisco, featured thousands of booths representing food and drink companies. It was a great place to check out the next big culinary trends: Put your money on coconut, chia and gluten-free. One interesting trend, visible in full-force at the Fancy Food Show, finds famous chefs branching out into retail and otherwise expanding their public platforms. Living in the era of the celebrity chef gives us easy access to their genius, even right at home. 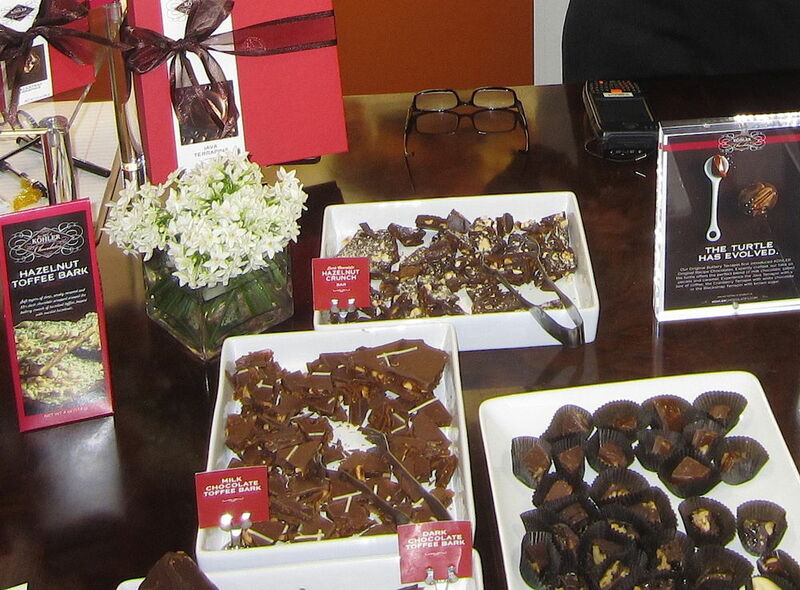 Some chefs were there in person, using products offered at the show in lively cooking demonstrations. Thomas Weibull, executive chef of the Velvet Room in San Francisco’s historic Clift Hotel, was a fixture in the “Food Philippines” aisle, discussing and cooking with mangoes, coconuts, pili nuts, muscovado sugar and other staples representing his Filipino heritage. 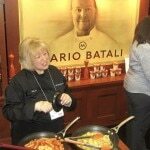 Mario Batali, best known for his Food Network career and a string of restaurants including New York’s Babbo and Las Vegas’ B&B, was represented by a booth showcasing his line of pasta sauces, all of which are made with San Marzano tomatoes imported from the Sarnese-Nocerino region northwest of Salerno. 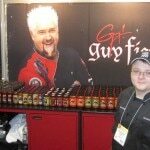 Fellow Food Network star Guy Fieri was represented by a booth displaying his range of salsas and barbecue sauces, which are served at Guy’s American Kitchen & Bar in New York’s Times Square and in Fieri’s other restaurants. 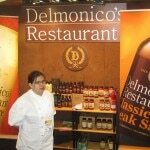 NYC classic steakhouse Delmonico’s also had a booth at the show exhibiting its line of sauces. A newcomer to the trend this year was Dio Deka Foods, a range of pre-packaged Greek foods based on popular dishes at the popular Los Gatos, CA restaurant. These include moussaka eggplant-beef casserole; lamb-and-beef keftethes meatballs; tzatziki yogurt dip, and feta-cheese-based tirokafteri and htipi spreads. Also on hand were companies that supply food and drinks to important restaurants and hotels. For instance, Fresh Origins — the nation’s largest producer of hand-picked microgreens and edible flowers — has among its many hospitality-industry clients Oakland’s Lake Chalet restaurant and Berkeley’s luxurious Claremont Resort & Spa. Valrhona, founded 90 years ago in France, regularly supplies chocolate to master chefs Dominique Ansel of New York City’s Dominique Ansel Bakery, Bill Corbett of San Francisco’s Absinthe Brasserie & Bar, William Werner of San Francisco’s Craftsman & Wolves, and François Payard of Las Vegas’ Payard Patisserie & Bistro. 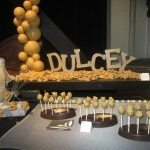 Valrhona had a booth at the Fancy Food Show and held a party off-site to debut its new Grand Cru bars, including the luxuriant and uniquely golden “blond chocolate” Dulcey 32%. Vermont-based Lake Champlain Chocolates, which was proudly debuting its new organic-bean, organic-sugar, microbatch, Madagascar-sourced Blue Bandana bars, provides Dark Thin Peppermint Squares to the Houstonian Hotel, Club & Spa in Texas. Another confectionery, Kohler Original Recipe Chocolates — whose sumptuous chocolate-nut-caramel Terrapins are a mouthwatering spin on the classic Turtles — is affiliated with the same Kohler bathroom-supply empire whose American Club resort is one of the Midwest’s finest. This restaurant-retail trend is really booming. Southerners have long loved award-winning chef Keith Schroeder’s High Road Craft Ice Cream & Sorbet at the Atlanta shop bearing its name. This year, the rest of us can finally buy this dreamily creamy stuff in supermarkets nationwide. It was great talking with the exhibitors at the Fancy Food Show and getting a backstage glance at all these amazing products before they reach the store shelves, restaurant tables and hotel pillows.